The Cooking of Southwest France by Paula Wolfert is really one of my favorite books in my collection. It’s a book I’ve used so much over the years and have never been disappointed (like this Cassoulet). Another reason I love it is that I helped test some of the recipe in there for the revised edition and it is the book that made Paula a friend of mine who loves to discuss food over email and certainly enjoys a conversation about a new clay pot I acquired or the recipes of my grandmother. Now, this recipe was the first recipe I tested for Paula and it is a marvelous dish for this time of year where even in Houston, it is cold and a bit dreary. Sometimes I try to modernize recipes and maybe find more efficient methods to cooking certain dishes. Not this time. I love this dish and I love the process from start to finish. So, I chose to apply Paula’s meticulous instructions to the letter. This is a classic no frills French dish that delivers a ton of flavor. 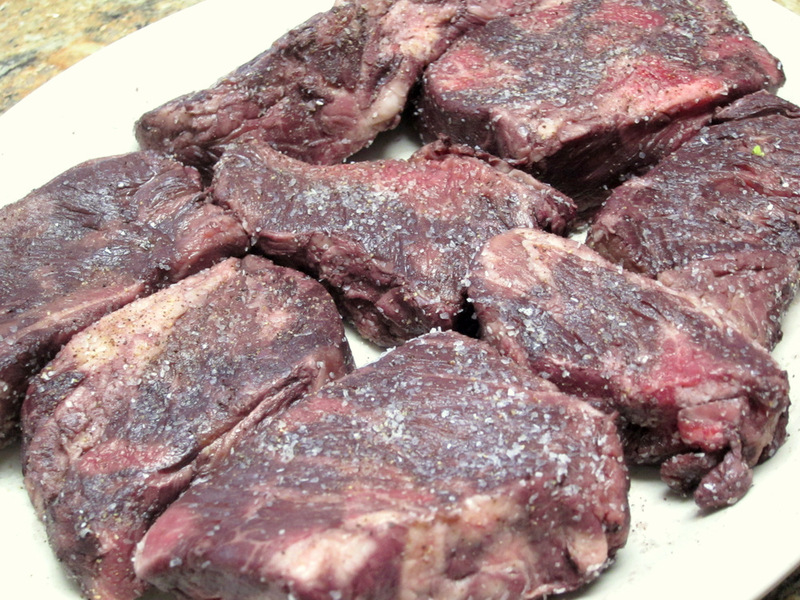 The beef short ribs (using boneless ones here) are marinated in plenty of red wine and aromatics including a good dose of dried Porcini (Cepes in French) mushrooms. 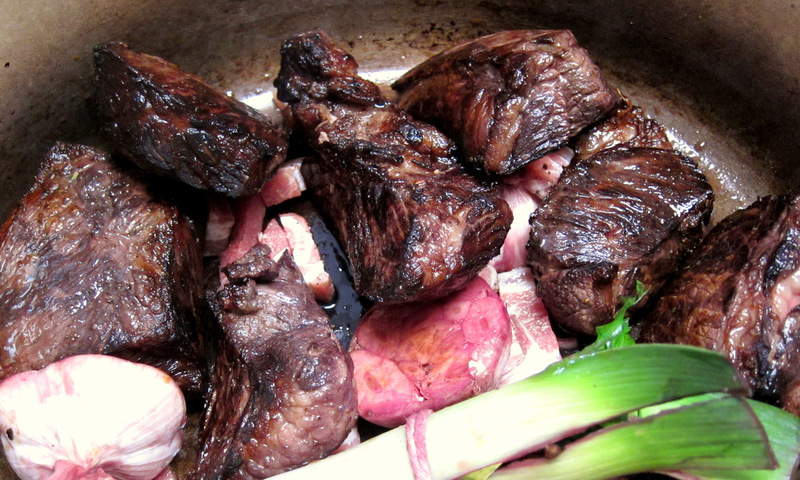 After 12 hours or so, the meat is browned in duck fat. the marinated veggies; carrots, leeks,onions and celery; also get browned after meat. 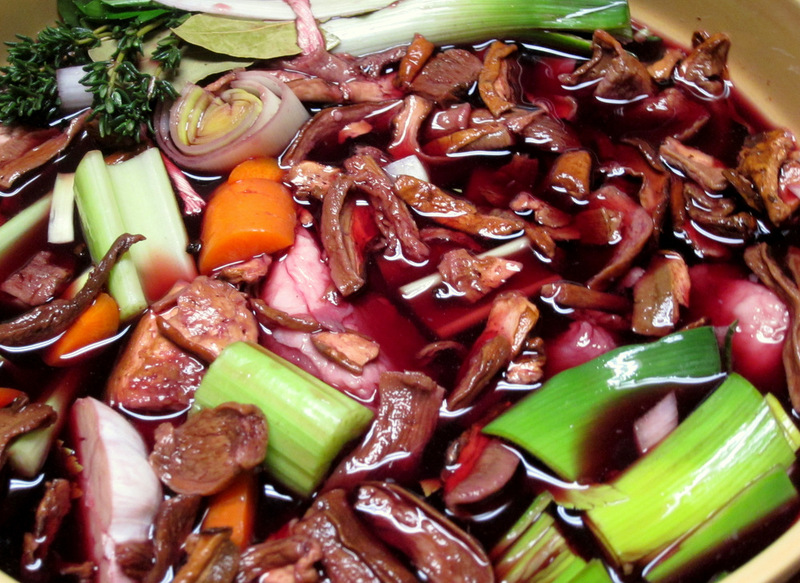 The meat and vegetables go in a nice clay pot and then get gently braised in stock and plenty of red wine for a few hours. 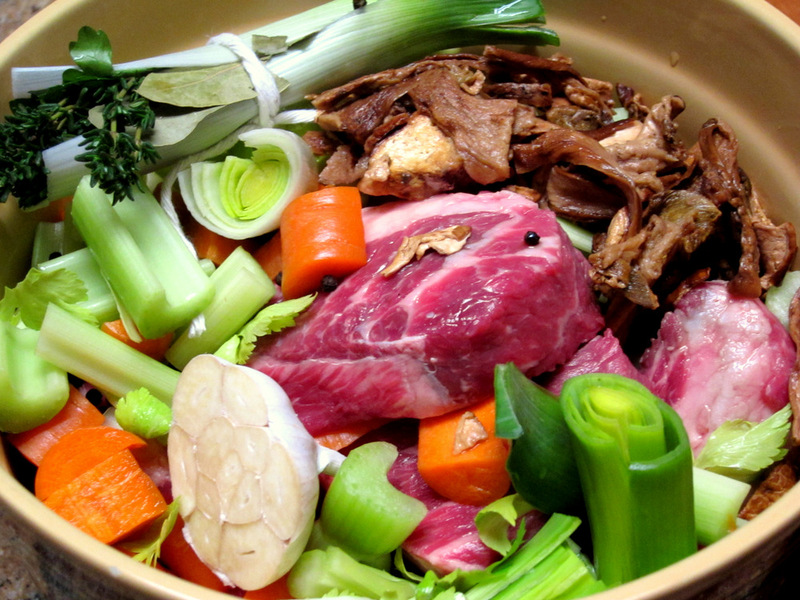 When the meat is cooked it is reserved separately from the cooking liquid and the vegetables are discarded. To finish, the meat is combined with the reduced de-greased cooking liquid and sautéed mushrooms, pearl onions, glazed carrots and halved pitted prunes. The mixture is allowed to simmer for 10 -15 minutes while I prepared the cornmeal cakes. The cornmeal cakes are what Wolfert recommends to serve with this. My kids love those ever since I made similar ones to accompany the pork cheek recipe from The French Laundry. So it was a no brainer that I would make them. Just cooked and set polenta, cut into rounds and coated in flour before being pan-fried in duck fat. This really is a sublime dish that is rich but not cloying. 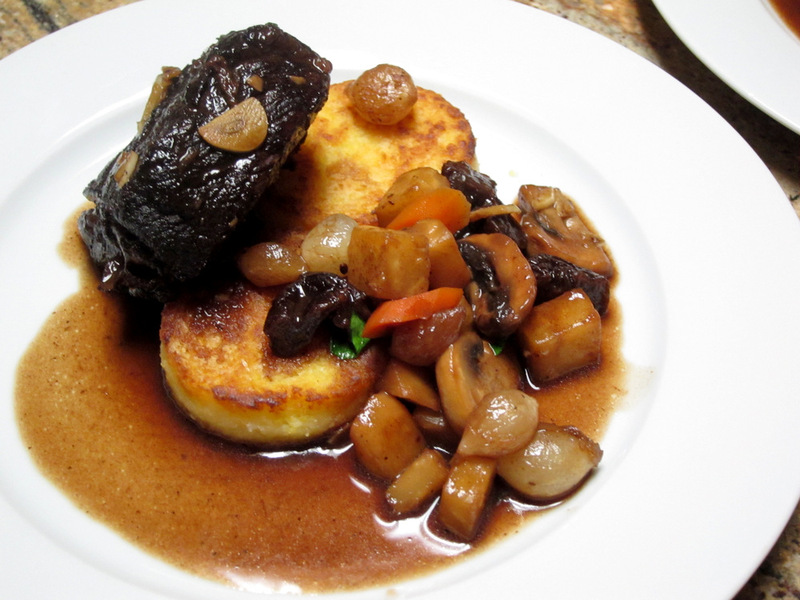 It is perfectly balanced with meaty flavors and jolts of sweetness from the prunes and acid from the large quantity of wine in the braising liquid. The polenta cakes are the ideal accompaniment. they are mild, a bit crispy and fluffy enough to sop up the cooking juices. This recipe is but one of many superb recipes in this classic of a book. All of those pictures are just too delicious looking! Honestly, anything that involving browning meat in duck fat has to be a winner. Also love the polenta cakes for soaking up pan juices. I will certainly need to give this recipe a try before the weather warms up! Thank you Jessamine. It’s a lovely dish to make and eat! If you do not have the book, you really should get it. It is simply a masterpiece. My copy is getting a bit tattered due to use by now and I really should get a backup. Looks great. 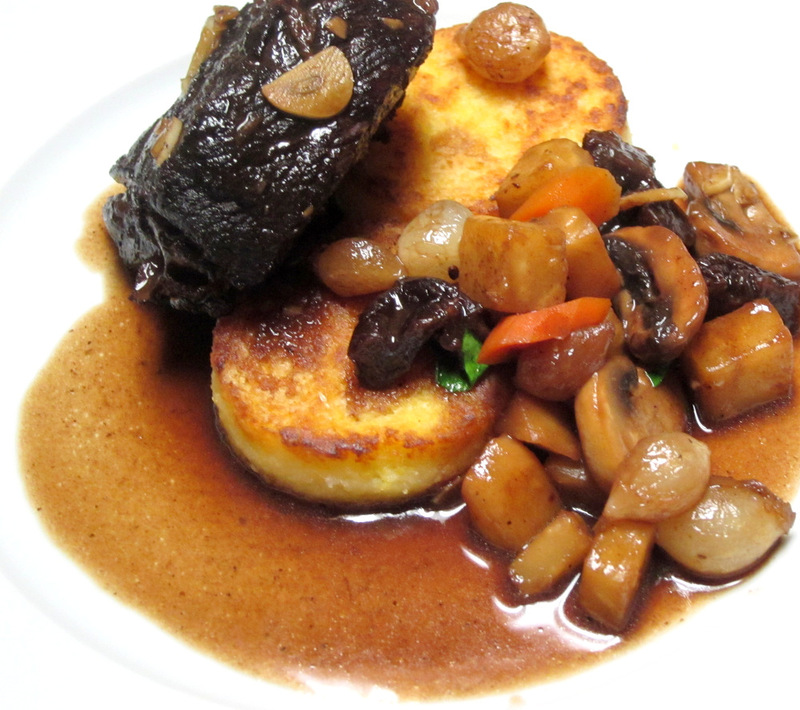 Seems similar to boeuf bourguignon except for the cepes and prunes.